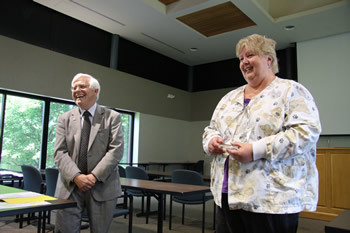 Debbie Tate was the recipient of the Dean’s Impact Award presented to a staff member. MU College of Veterinary Medicine Dean Neil C. Olson selected two individuals from within the college and a state senator for recognition to receive a 2016 Dean’s Impact Award May 18. The awards, established in 1993, are presented for outstanding and sustained impact on the College of Veterinary Medicine. One to three individuals, usually a staff member, faculty member and individual from outside of the college, may be selected annually based on major contributions that have had significant positive impact on college programs. The honorees received an engraved crystal plaque presented during a reception that also recognized staff members who achieved milestones in their years of service to the University of Missouri. This year’s Impact Award winners were Debbie Tate, Jeffrey Bryan, DVM, MS, PhD, and Missouri Senator Dan Brown, DVM. 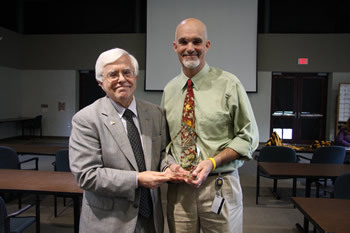 CVM Dean Neil C. Olson presents the Dean’s Impact Award for faculty to Associate Professor Jeffrey Bryan. Tate is an oncology technician and clinical trials coordinator for the oncology service. She joined the college in 1990. She has served on numerous committees, including the hospital advisor board, and has been asked to moderate the technician exam for the American College of Internal Medicine 2016 Conference. Commended by her nominators for working to further her own knowledge and skills, Tate earned a Veterinary Technician Specialist certification in oncology in 2015. Bryan is an associate professor of oncology and serves as the director of both the Comparative Oncology and Epigenetics Laboratory and the Scott Endowed Program in Veterinary Oncology. He is also the president of the American College of Internal Medicine specialty of oncology. Bryan was credited with improving the quality and recognition of the oncology department, as well furthering collaboration at MU and bringing the college to the forefront of nuclear medicine research. 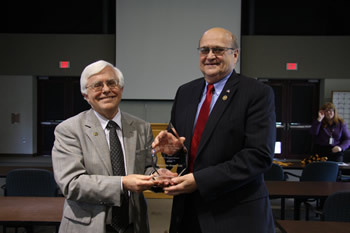 Dean Olson also honored Missouri Sen. Dan Brown with the Impact Award presented to an individual from outside the CVM. Brown earned his DVM at the college in 1977. He was elected to the Missouri House of Representatives in 2008 and the Missouri Senate in 2010 representing District 16. He has served on numerous legislative committees including Agriculture, Food Production and Outdoor Resources; Appropriations; Education; Veterans Affairs and Health; Joint Committee on Life Sciences and Joint Committee on MO Health Net. He has been an advocate for veterinary medicine and a supporter of the college, and is credited with helping to fund the Dr. Merrill Townley Large Animal Veterinary Student Loan Program.